18 Barbies, or: How many toys does one child need? 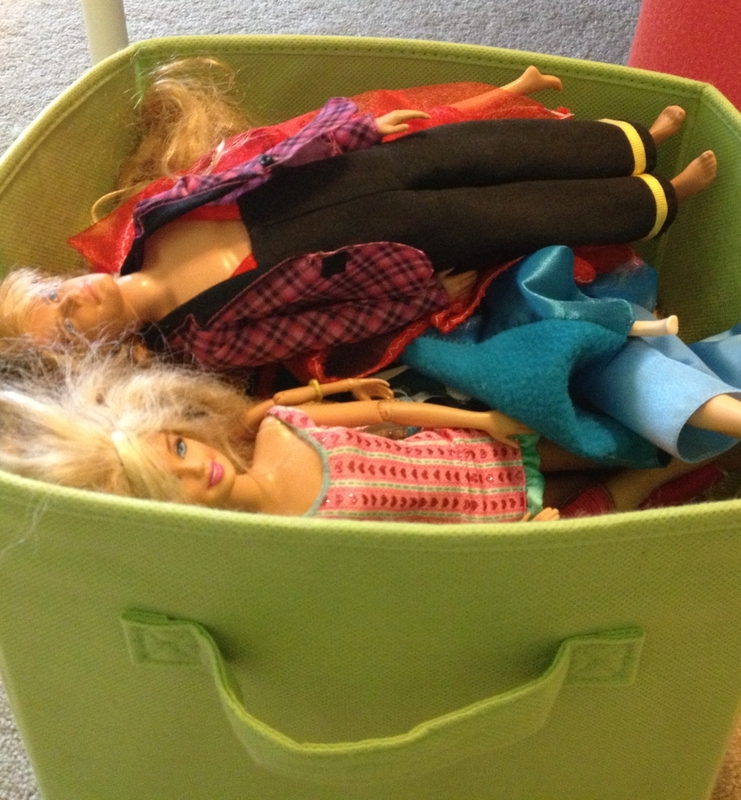 I counted my daughter’s Barbies. There was 18 (I had weeded some a few months ago). I didn’t even think of counting Barbie shoes, purses and hair brushes. Who has time for that? 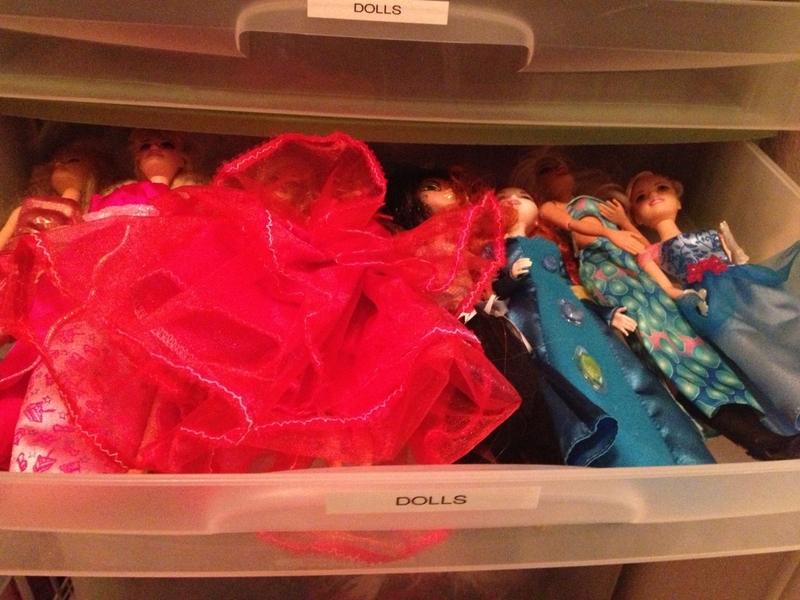 The Barbies and accessories are organized in various containers. A few years ago I went through similar exercise and counted all the stuffed bears my kids had. There was over 20. I kept them organized in built-ins in the living room. Not so long ago I organized kids books, and separated a big pile of Disney movie synopsis-type “literature” to be donated. How many toys does a child really need? And by the same token, how many hair accessories, jewelry, PJs and clothes does one fast- growing child need? I don’t know what exactly prompted me to realize it: maybe because I am on my fourth child and I’ve seen it all before. Or maybe because I have a big house and am getting tired of keeping all the crap treasures organized. Possibly, because growing up I had 1/34th of what my kids have, and was happy with what I had. It may also be due the fact that I am turning 40 this year and hit the point of re-assessing my previously set beliefs. Regardless of how I got there, my approach to kids’ (and my own too, btw) stuff has solidified as “less is more”. I regularly discuss with my son and daughters which toys they currently like to play with, and which they don’t care about. They put the latter in a bag which gets donated. I emphasize to them the importance of keeping only the most beloved and the most played with toys. I want them to learn to be fine with getting rid of something if it has no meaning or value to them (I see a major barbie weeding in the near future). The remaining toys are organized by categories. The key to keeping toys organized is easy access to toy storage. Right now we are in the process of re-organizing my daughter’s room, with this goal in mind. Stay tuned for the result! Each morning I take one bin out and bring it in the living room. At the end of the day the toys go back in the bin and in the closet. The next morning she sees “new” toys from another one out of the 5 bins. One bin of toys per day proved to be plenty to keep her occupied. (I will explain why I switched to this system in a separate post). I view books just like I view toys. A lot of them have no value and no meaning. It is harder to admit with books, because I grew up with great appreciation for reading and I want my kids to share it. However, I do judge a book by its cover. Only books with literary value get to stay. For a long time I was the mom who felt the pressure to buy the kids as much clothes/accessories as I could afford. At times I couldn’t afford much, so I shopped consignment stores, “the best sales of the season” etc. I followed the sales with the “lowest prices” religiously because I needed to stock up! Over the years I realized that most of that stock gets too small because kids grow out of it too fast, or doesn’t get worn because they stick to a handful of favorites. What’s the point chasing sales and digging through piles of clothes in consignment stores? I got tired of sorting through storage bins with obsolete but barely worn clothes. Now I buy the bare minimum but the kind that I know my children will wear. I buy clothes with their preferences in mind: I know my daughter prefers shorts over skirts, and my son will not touch jeans if there are twill pants right next to them. The kids do their own laundry, and keeping smaller inventory makes it easier for them to stay on top of their laundry and closet organization. I have a post coming up dedicated to Barbie alone, because she is such a” big deal”. But today I would really like to know your approach to handling kids’ belongings. Do you let the kids decide what they want to keep, or do you set your own limits? GREAT post! You know I believe in less IS more! With my kids it depends on the child. One of my kids has no problems letting things go, but my other two like to hold to things. I usually coach them through the purging process. I also like what you said about kids clothing, they really only need the necessities as they are usually growing so fast! Isn’t it funny how kids’ personalities differ even in such small things? All four of our kids are completely different people! And you are right, Morgan — coaching is an important step. It can be so overwhelming for them, and they usually need help with managing their belongings. I found that it works best to break it down in small steps/categories. Kids minds deal with organization in small “portions” a lot better than processing the whole concept at once. Oh, I struggle with this all the time. Sometimes I am embarrassed by how many toys my son has — most notably Legos and stuffed animals. I have not bought him a stuffed animal in years, but somehow they have multiplied thanks to grandparents, friends, maybe even weird plush mating rituals in the closet. I don’t know. The stuffed animals are hard for my kid to let go; he says each one is special, but it’s becoming clear that only a few of them actually are since he’s forgotten the names of 20 or so of them in the months they’ve been stashed in the playroom closet. I think it’s time to get rid of them. The Legos, though, will stay. They are the toys he plays with pretty much exclusively, and I know they are the kind of thing that can be passed on and enjoyed by another generation. Because he’s actually playing with Legos that were mine and my brothers. But I don’t think we need to buy any more sets because he’d rather free build than build a set. So, what’s the point. And don’t get me started on books. I am a reader and a lover of literature, but I have no trouble letting books go once i’ve finished reading them (with the exception of a few favorites.) Convincing my son to get rid of his books is much more difficult, and I find myself being more sentimental about them, too. Hi Amy! Yes, kids get attached to their things, just like the adults! It is hard to part with some things you are used to seeing around, but I think it’s a great habit to nurture– making a distinction between really sentimental and valuable things and the ones you keep “just because I’ve always had them”. Legos are a wonderful toy! My 7 y.o. daughter is actually more into them than her older brother. I wouldn’t mind if my kids spent all their free time playing with Legos. We have organized them by color in several plastic tubs, so they are not all over the place. And toys that used to belong to previous generations are the best! We have a bucket of blocks that used to be my husbands, that our toddler now plays with. I love watching her play with them! So good!!! I love those bins for toys! I am sure the Barbie world will be here soon… having 2 boys first it has been endless cars- I got rid of many! Thanks for linking up!